If your business relies on being able to give pedicures to clients with minimal difficulties, chances are that your space will benefit from a pedicure chair. When selecting your chair, ask a friend to accompany you on your hunt, as you will be able to test out the different qualities of the chairs together. For instance, if the chair is too low, it will give you back pain to carry out a service, but if the chair is too high, you will not be able to see your clients' feet properly. Hire the services of a professional plumber. Inspect your pedicure chair's warranty to discern whether or not a particular plumbing specialist in your area must be used. Failing to call on the help of a professional plumber when installing your chair may void your warranty. Inform your plumber of the pedicure spa's requirements. 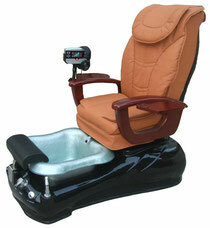 He will work with your needs to ensure that the foot spa works in the way you require it to. He will hook up the hot and cold water supplies, which is done in a similar way to hooking up a washing machine's hoses. He will also ensure that the foot basin has a place to drain, and so he may need to drill a hole in the floor to accommodate this requirement.